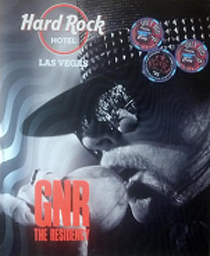 Guns N’ Roses Film Las Vegas Show In 3D - Rock Fuel Media Inc. Guns N’ Roses’ Las Vegas residency promised fans the chance to see Axl Rose and his new Guns perform in an intimate setting. Now it looks like everyone else will soon get the chance to see Rose in 3D. According to a posting on the band’s Twitter account, GN’R’s show Wednesday night (November 21) was filmed in 3D. GN’R also tweeted a picture of a behind the scenes look at the taping along with the caption “3D 2D looks like 10 cameras on this Street Of Dreams #AppetiteForDemocracy.” It still remains unclear, though, as to what will become of this 3D taping (as Chinese Democracy proves, a “sure thing release” doesn’t exist in the world of Guns N’ Roses). However, the real question is “Do we really want to see Axl Rose and the new Guns N’ Roses on a movie screen in 3D?” Hell, even the idea of seeing Slash in a 3D film doesn’t sound all that appealing. Then again, we admit that we were at first hesitant about the Metallica 3D film. Plus, seeing Rose in 3D might prove to be a nice alternative to waiting three hours in a theatre for an in-person live performance (at the very least, he can’t pull a no show in a 3D film).